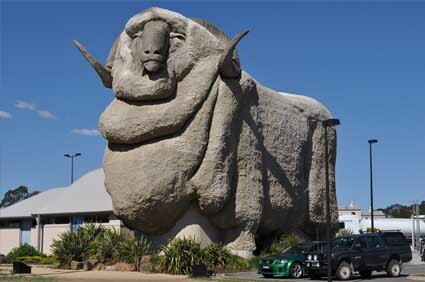 The Big Merino is a monument located in Goulburn, New South Wales, Australia. It was built in 1985. Standing 15.2 meters high, 18 meters long and weighing 97 tons. “Rambo” is its nickname given by locals, It’s contains a gift shop on the ground floor and a wool display on the second floor. 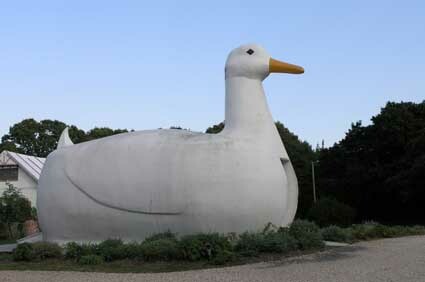 The Big Duck is a duck shape building located in Flanders, New York. It was built in 1931 by duck farmer Martin Maurer. It was an eye-catching shop used to sell ducks and duck eggs. In 1997, it was added in National Register of Historic Places. 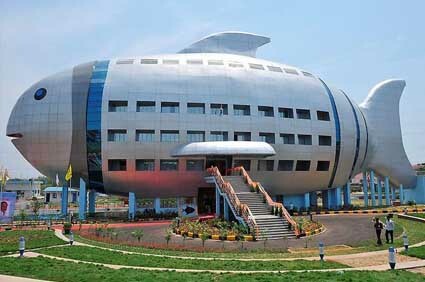 This big fish-shaped building is a regional office of the National Fisheries Development Board. It’s located near Hyderabad in India. According to Outlook India, this building is inspired by a “giant fish sculpture in Barcelona,” presumably the 1992 monumental sculpture “Fish,” by Frank Gehry. The building officially opened in April 2012.At night, bluish-purple spotlights pointed at the building give the impression it’s swimming through Hyderabad. 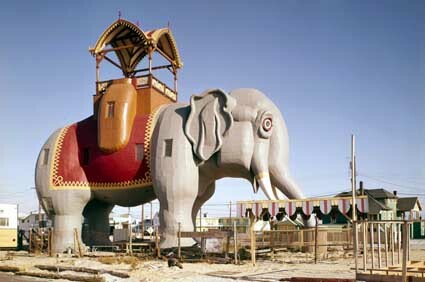 Lucy the Elephant is a six-story elephant-shaped building constructed in 1881 by James V. Lafferty in Margate City, Atlantic County, New Jersey. Originally it’s named “Elephant Bazaar” and the building is 65 feet high, 60 feet long and 18 feet wide. It weighs about 90 tons and is made of nearly one million pieces of wood. There are 22 windows and in construction required 200 kegs of nails, 4 tons of bolts and iron bars, and 12,000 square feet of tin to cover the outside. 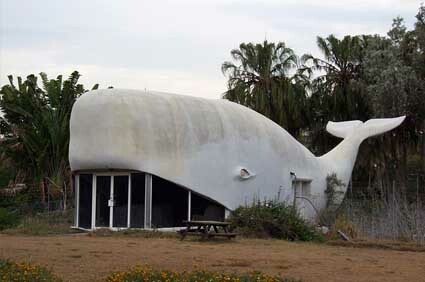 Kinka Whale House located in the south of Kinka Beach, Queensland, Australia, before Emu Park. 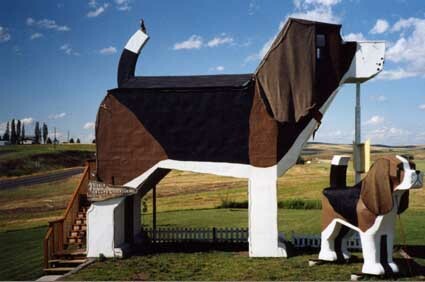 The Dog Bark Park Inn, built in the shape of a beagle, is a hotel located in Idaho, USA. It is a famous landmark in the state. It is also known as Sweet Willy by local residents. The hotel designed and built by Dennis J Sullivan & Frances Conklin and opened in August 2003. The Macau Pavilion building at Shanghai will take the shape of a jade rabbit lantern. It’s designed by Chinese firm Carlos Marreiros Architects. It will be wrapped by double-layer of glass membrane and feature fluorescent screens on its outer walls. 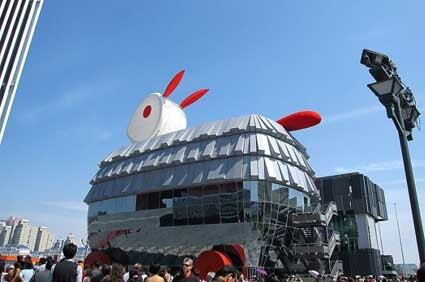 Balloons will serve as the head and tail of the ‘rabbit’, which can be moved up and down to attract visitors. The Snail House in Sofia’s district of Simeonovo was built in 2008 and owned by a construction professional who designed the golf courses in Japan and France. 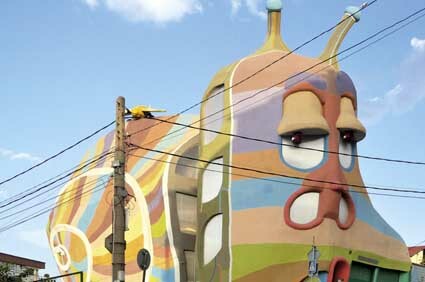 It is a colorful 5-storey building in the shape of a snail. 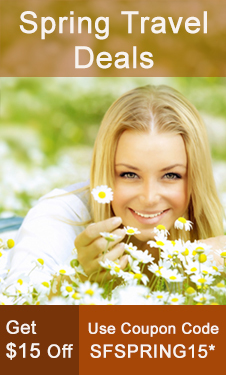 It constructed in high quality of lightweight and environmentally friendly materials. It is claimed that in the construction was not used any brick. Wat Samphran is a unique temple off the beaten tourist path. 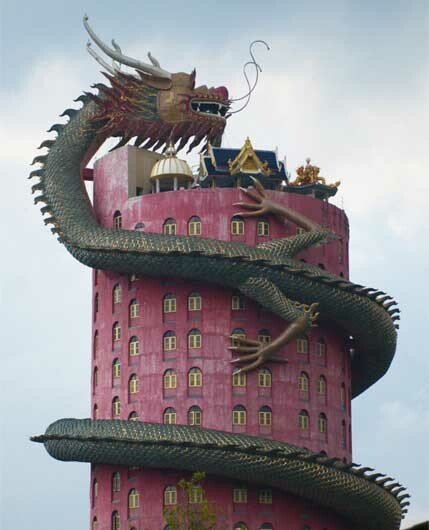 The building is about 17 stories tall, with a giant dragon spiraling to the top. Its grounds include many sculptures of other beasts and a giant buddha made of bronze. The Great Pyramid of Cholula is a huge complex located in Cholula, ten minutes outside of Puebla on the old highway to Mexico City. It’s also known as Tlachihualtepetl and the largest archaeological site of a pyramid in the New World. The pyramid stands 55 metres (180 ft) above the surrounding plain and in its final form it measured 400 by 400 metres (1,300 by 1,300 ft). Originally it was constructed over 2000 years ago. It was a traditional temple dedicated to the god Quetzalcoatl. The architectural style of the building was linked closely to that of Teotihuacan in the Valley of Mexico, although influence from the Gulf Coast also is evident, especially from El Tajin. In ancient times, Cholula was a religious capital of Mexico. The Great Pyramid of Cholula was constructed in four stages and it was dedicated to the god Quetzalcoatl. It started from the 3rd century BCE through the 9th century CE. The pyramid was constructed along with affiliated temples and it was carried out by various groups over hundreds of years. It has a base of 450 by 450 metres and a height of 66 m. According to the Guinness Book of Records, it is the largest pyramid in the world, even larger than that of the Great Pyramid of Giza in Egypt. The ceramics of Cholula were closely linked to those of Teotihuacan and both sites appeared to decline simultaneously. 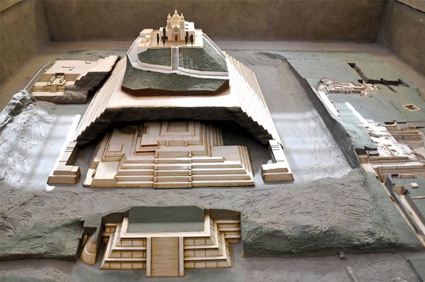 The Postclassic Aztecs believed that Xelhua built the Great Pyramid of Cholula. At first glance, the Pyramid just looks like a grassy hill crowned by a church. But if you climb the unreconstructed pyramid beside it, you can plainly see the geometric outline of the original structure, which rises from the ground into four levels. Archaeologists have reconstructed one side of one of the lower segments of the pyramid and have dug some five miles of tunnels into the pyramid, which visitors are free to explore. The Pyramid of Khafre is the second tallest and largest pyramids of Giza and the tomb of the Fourth-Dynasty pharaoh Khafre (Chefren), who ruled from c. 2558 to 2532 BC. It also known as the Pyramid of Chephren.Khafre who was a son of Khufu and its pyramid is only approximately 10 feet shorter than his father Khufu’s nearby Great Pyramid. It appears to be slightly larger however as it is build at a higher elevation. The pyramid has a base length of 215.5 meter (706 ft) and rises to a height of 136.4 metres (448 ft). 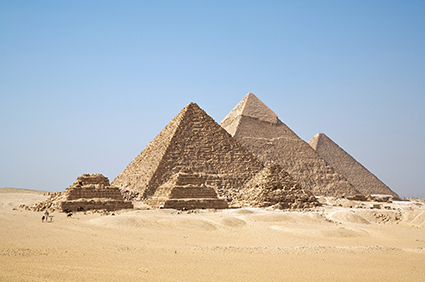 The pyramid was made by limestone blocks and each block weighs more than 2 tons. The most distinctive feature of Khafre’s Pyramid is the topmost layer of smooth stones that are the only remaining casing stones on a Giza Pyramid. The pyramid interior structure is much simpler than Khufu’s pyramid, with a single burial chamber, one small subsidiary chamber and two passage ways. But the mortuary temple of this pyramid was more complex than Great Pyramid, it was filled with statuary of the king–over 52 life-size or larger images originally filled the structure. The valley temple of Khafre’s Pyramid is one of the best preserved Old Kingdom temples in Egypt. It is a masterpiece of ancient Egyptian monumental architecture and in 1869 this temple became the backdrop for the ceremonial opening of the Suez Canal. The temple front face present on the east with a large terrace paved and limestone slabs. In the middle of the terrace, found a fragment of small, simple, wood and matting unearthed structure that may have been the location of a statue depicting Khafre. The temple core wall was built by huge blocks and the inner core was then covered by pink granite slabs. The entrance door of temple was led to a T-shaped hall that made up a majority of the temple. The hall area adorned with sixteen pink granite pillars and they supported the roof. At the other end of the T shaped hall, an opening gave way to a passage that led to the northwest corner of the temple and there joined the causeway. The causeway leading from Khafre’s valley temple to the mortuary temple, you have to see the first truly colossal sculpture in Egyptian history: the Great Sphinx. It was carved from bedrock in front of Khafre’s pyramid. The Sphinx depicts the pharaoh as a human-headed lion, wearing the headdress of the pharaohs. 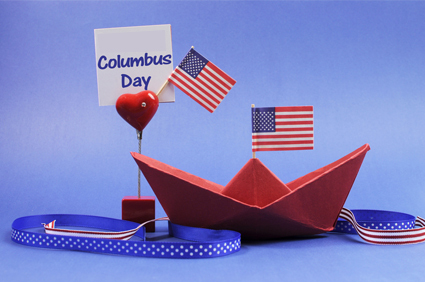 Columbus Day is celebrated in the honor of Christopher Columbus’s Birthday in United States. He was the explorer who landed in America in 1492.Columbus Day is annually celebrated on the second Monday of October. It is a long three day weekend holiday and people celebrate it with different activities. Most of people believed the world was flat and you would fall off the edge if you traveled too far, but Columbus believed the world was round and you could sail around it safely.In 1492, Christopher Columbus started his journey to discover new lands for the King Ferdinand and Queen Isabella of Spain. The whole team of sailor divided in three ships: the Pinta, the Nina and the Santa Maria. Columbus had sailed to faraway lands before including Guinea and Iceland. Some problems with the Nina and the Pintaship, they caused a month-long delay in the Canary Islands. Columbus set his sail again on September 3, 1492 and 33 days later on October 12, 1492 he discovered the new land (America). In 1937, President Franklin D. Roosevelt declared Columbus Day as a national holiday and in 1971, it was fixed to the second Monday in October 12. Columbus Day is a national holiday in United States. You can see the mixture of Italian-American heritage and culture in Columbus Day celebration. Local groups are hosting parades and street fairs featuring colorful costumes, music and Italian food. People enjoy lots of activities including pow-wows, traditional dance and lessons about Native American culture. We all know it was a three day weekend holiday and most of people plan to go for a trip to enjoy this long weekend. If you are planning a Columbus Day trip, here are the top Columbus Day weekend getaways: New York City, San Francisco, Boston, Montauk, Miami, Denver, Burlington in Vermont, The Poconos, Lake Placid, Newport and Providence. The Great Pyramid of Giza is the part of the Giza Necropolis that includes the three prominent pyramids of Menkaura (Mycerimus), Khufu (Cheops) and Khafra (Chephren). It is the oldest and largest pyramid of Giza, situated at west of the Nile River, near Cairo, Egypt. It is also known as the Pyramid of Khufu or the Pyramid of Cheops. 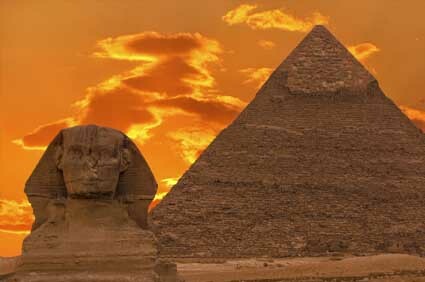 It is the only one of the famous “Seven Wonders of the Ancient World” that still stands. According to Egyptologists the pyramid was built as a tomb over a 10 to 20-year period concluding around 2560 BC. It was 230.4 metres (755.9 ft) long on each side, 146.5 metres (480.6 ft) high and is composed of 2,300,000 blocks of stone, each averaging 2 1/2 tons in weight. The mass of the pyramid is estimated at 5.9 million tonnes. But, with erosion its height now is 138.8 meters (755.9ft). It is fully covered by casing stones and some of the casing stones that once covered the structure can still be seen around the base. There are three chambers inside the Great Pyramid. The lowest chamber of this pyramid is cut into the bedrock upon which the pyramid was built and was unfinished. The Queen and King Chamber are higher up within the pyramid structure. It is the only Egypt pyramid to contain both ascending and descending passages. In the Giza complex you can see two mortuary temples in honour of Khufu, three smaller Khufu’s wives pyramids, an even smaller “satellite” pyramid, a raised causeway connecting the two temples, and small mastaba tombs surrounding the pyramid for nobles. It is the tallest man-made structure in the world for over 3,800 years. The Egyptian people believed that death was merely the beginning of another journey. That the main reason of pyramids were constructed not just as burial places but also as vaults with the capacity to hold items the departed Pharaohs would need in the next life. India is full of wonders and unbelievable things. 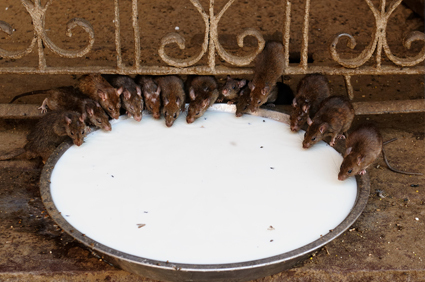 Karni Mata(Mata means mother) Temple is one of them; where near about 20,000 rats are worshipped, fed and protected as they scurry between the feet of tourists. 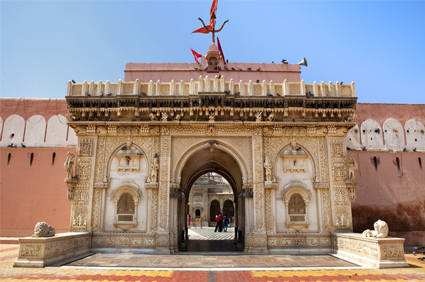 Karni Mata Temple is a famous Hindu temple dedicated to Karni Mata at Deshnoke, 30km from Bikaner in Rajasthan, India. It is also known as the Temple of Rats. The holy rats living in temple are called kabbas and thousands of visitors come here to pay their respects and get blessings. Karni Mata’s stepson Laxman drowned in a Kapil Sarovar pond in Kolayat Tehsil. Karni Mata implored Yama (the god of death) to revive him. After first resisting, Yoma gave in, promising that the boy and all of Karni Mata’s male descendants would be reincarnated as rats. Some local folklore believes the story behind rats at the temple is different. They say that 20,000 strong army men deserted a nearby battle and came running to deshnoke. Upon learning the sin of desertion, punishable by death, Karni Mata spared the lives but made them rats and offered the temple as the future place of stay. The army of soldiers expressed their gratitude and promised to serve Karni Mata lifelong. There is a popular belief that all rats are holiest rats and when they die, they are born as humans. Although, there are around 20000 rats here and they all are of same size, shape, weight and height. If one of the rats is killed, it must be replaced with one made of solid gold. Eating food that has been nibbled on by the rats is considered to be a “high honor” and it does not spread any disease. The temple was completed in the early 20th century by Maharaja Ganga Singh of Bikaner in the late Mughal style. In front of the temple is a beautiful marble facade, which has solid silver doors. Across the doorway there are more silver doors with panels depicting the various legends of the Goddess. The image of the Goddess is enshrined in the inner sanctum. If you are planning to visit India, then come and see this place. You will be surprised to see this in real. The Belgian Beer Weekend is not more popular internationally like Munich Oktoberfest, but Belgium is famous for beer making and produces over 450 different varieties of beer, including some world famous brands. 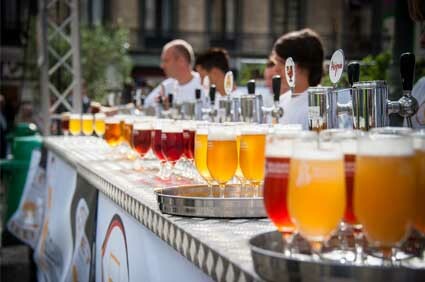 This frothy festival will fill Brussels’ Grand Place with beer tastings, parades, historic brewery carts and beer wagons. 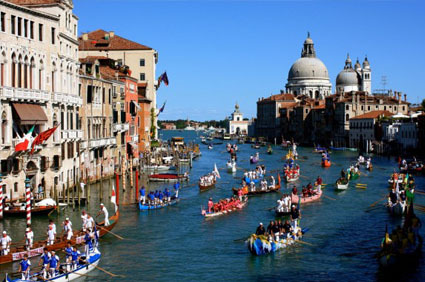 Every year the Historic Regatta festival is held on the first Sunday of September in Venice. The best part of this festival is “Campioni su Gondolini” race, where a series of small and sporting gondolas fly boats doing race on the Grand Canal. The boats and costumed crews are decorated in 16th-century style. 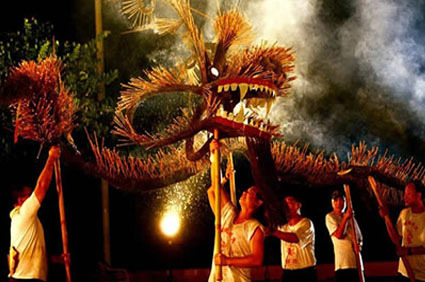 The Tai Hang Fire Dragon Dance is another beautiful example of Hong Kong’s traditional culture. It is a main part of the celebrations of the Mid-Autumn Festival in Hong Kong. In 19th century, the people of Tai Hang performing a dragon dance to stop a bad luck afflicting their village. Now firecrackers, drums, dancing and a massive man-made dragon characterize this historic event. This festival is a great opportunity to taste award-winning Hungarian wines, and this year the best of Portuguese wines. It is one of the long awaited events in Budapest in the fall season. Even if you are not a wine lover don’t worry you will have something that picks your interest: fine food, concerts, cultural programs, children activities and much more. The Kentucky Bourbon Festival is a 6 day festival, full of smooth Bourbon, delicious food and great entertainment. Here you can enjoy a healthy dose of Kentucky hospitality thrown in for good measure. 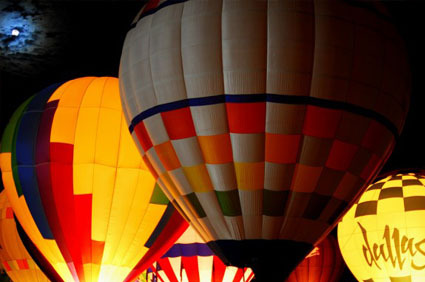 It is a wonderful six-day event full of activities and there is something for all ages and interests. 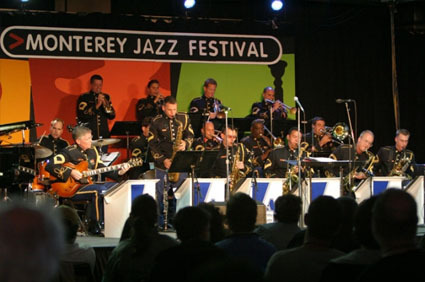 The Monterey Jazz Festival is one of the longest consecutively running jazz festivals in Monterey, California. This festival founded by San Francisco jazz radio broadcaster Jimmy Lyons in October 3, 1958. Here you can enjoy over 500 musical performances on eight stages over the course of three days. 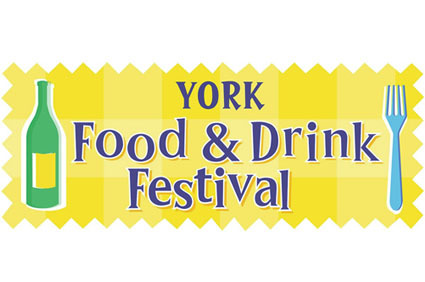 York Food and Drink Festival is tempting visitor to experience a Yorkshire and French cuisine. Foodies from around the world gather in York for the world-renowned flavours of the York Food and Drink Festival. Oktoberfest is the world’s largest funfair and one of the best festivals held annually in Munich, Bavaria, Germany. Over two weeks you can enjoy with beers, bratwursts, parades, carnival rides and so many events, you won’t want to miss a day. 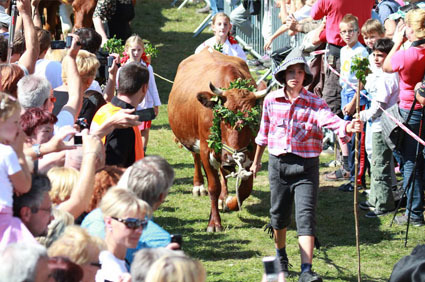 On the third Sunday in September, Bohinj is the venue of the Cow Ball. It is a traditional event that shows the old traditions of Bohinj pastoral farming and cheese-making that accompanied the return of cowherds and their cattle from the high mountain pastures. Decorated cows are the main attraction of this event. Folk dancing, horseshoe throwing and log sawing are just a few of the many rural activities you can engage in at the annual Cows’ Ball. 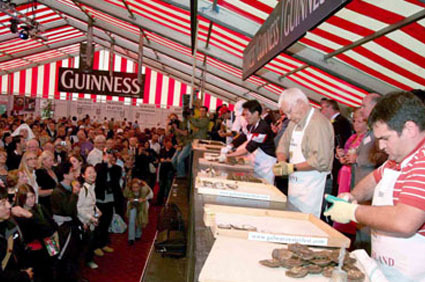 Ireland is more popular for its beers than its oysters, but do you know the combination of beers and oysters is the main attraction point of Galway International Oyster Festival. So you won’t want to miss the anticipated oyster shucking competition, late-night masquerade, live musical performances and bounty of mouth-watering seafood dishes. Oktoberfest is the world’s largest funfair and one of the best festivals held annually in Munich, Bavaria, Germany. It is a sixteen day festival starting from late September to the first weekend in October. Oktoberfest means “Reason to celebrate” and is associated with fun & partying with endless flow of beer. Around 7 million litres of beer are drunk during the festival. 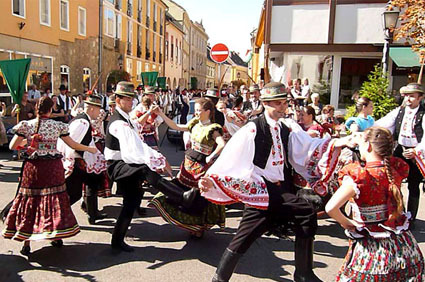 It’s time to l ink arms with locals, swing to the Oompha of Bavarian bands, admire traditional costumes, and get a good helping of German hospitality. From the 1960s onwards Munich’s Oktoberfest has drawn international visitors coming to experience this great slice of Bavarian culture and drink beer, eat sausage and join together in song. Today there are around 6 million visitors to Munich’s Oktoberfest, visiting over the course of the two and a bit weeks. 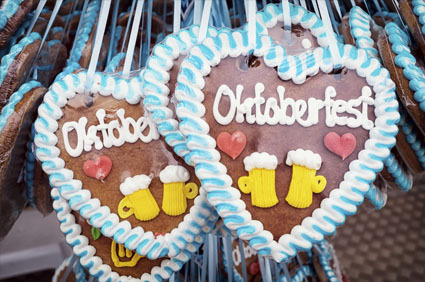 The original “Oktoberfest” occurred in Munich, on October 12, 1810. Crown Prince Ludwig was married to Princess Therese of Saxony-Hildburghausen on 12 October 1810 and the citizens of Munich were invited to attend the festivities and celebrate the happy royal event. The event was held on the fields in front of the city gates and the fields were renamed Theresienwiese (“Theres’a Fields”) to honor the Crown Princess, although the locals have since abbreviated the name simply to “Wiesn”. In the presence of the royal family, the horse races marked the closure of the event that was celebrated as a festival for the whole of Bavaria. The decision to repeat the horse races in subsequent years gave rise to the tradition of Oktoberfest. By 1818 there were a number of live entertainments in place and the beer tasting was introduced in 1896. Since 1950, there has been a traditional festival opening: A twelve gun salute and the tapping of the first keg of Oktoberfest beer at 12:00 by the incumbent Mayor of Munich with the cry “O’zapft is!” opens the Oktoberfest. The Mayor then gives the first beer to the Minister-President of the State of Bavaria. Oktoberfest main attraction is 13 elaborate beer tents, which are set up for the two-week during this festival. Not only beer is the attraction of this festival, Oktoberfest is really an oversized state fair, with a carnival atmosphere and carnival rides. There are near about 80 rides attractions in this festival. Ferris wheels, roller coasters, and other fair rides are a big part of Oktoberfest. There is no charge to get into the Oktoberfest and you can walk around for free. But you have to pay for food, drink, rides and other attractions. You can easily buy vouchers for beer and food in the beer tents. A typical tent table reservation costs 24 to 38 euros (about $34-$54) per person, including a voucher for two litres of beer and typically a roasted half-chicken. You can also book your table via fax or mail – per table (6 to 10 people) or in units of 10, 20, etc.